Have the door panels in your 83-84 Fox Mustang Convertible seen better days? Get a set of these pre-assembled deluxe door panels to bring it back to new! 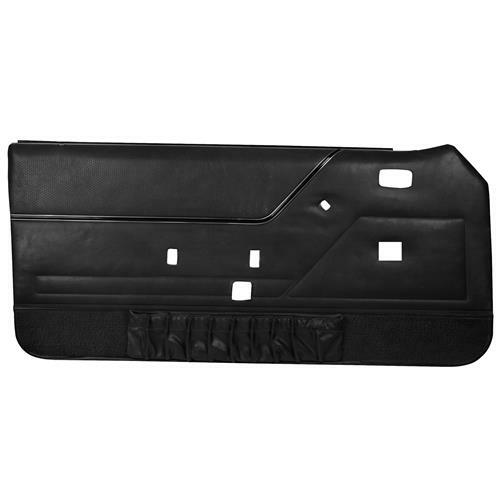 This pair of fully assembled Mustang door panels includes new inner belt weatherstrips, door lock knob grommets, lower door carpet and map pockets. No assembly required, all you have to do is pull them out of the box and install them on your Mustang. This set of Mustang door panels ship with the material covering one side of the door panel without cut outs. The back side of the door panel board has perforated opening locations for such things as door handles, window cranks, electric windows, speaker covers, etc. Chalk marks on the material face act as a guide where cuts are to be made for arm rests, door handles, etc. Once the material is cut all of the chalk marks can be removed with alcohol or soap and water. If you have a question about which openings to cut and which ones not to cut, please refer to your original door panel as a ready reference. It is your responsibility to remove whatever perforated openings that are required for your Mustang. It is recommended to carefully use a single edge razor blade to remove perforated openings. Once the openings are cut out, the material should be cut to accommodate the part that needs to go into the opening. This can be done by using a razor blade or razor knife to cut an "X" through the material in the center of the opening. Please be careful not to cut the "X" all the way to the edge of the opening in the board. It is suggested to leave 1/4" of material inside the opening so it looks clean when the material is folded back. After the "X" cut is made you can fold back the material so you can install door handles, arm rests, etc. If desired, you can tape of glue the flaps of material to the backside of the board, but it is not required as once the hardware and door panel are installed, you will not be able to see the loose material. If car is equipped with manual crank windows, hardtop door panels will need to be used.